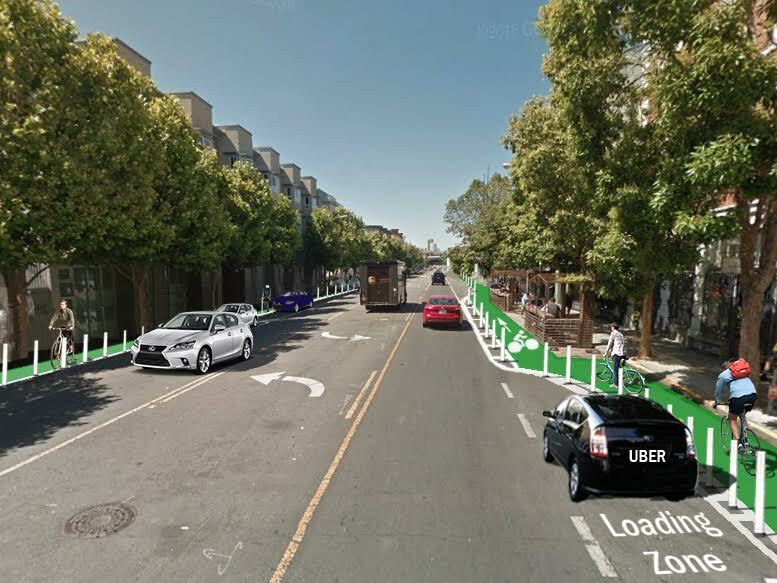 Streetsblog was up before dawn this morning, an invited guest of SFMTrA–the guerrilla group that’s given up waiting for the city to make our streets safer–for a quick infrastructure upgrade to Valencia Street’s bike lanes. 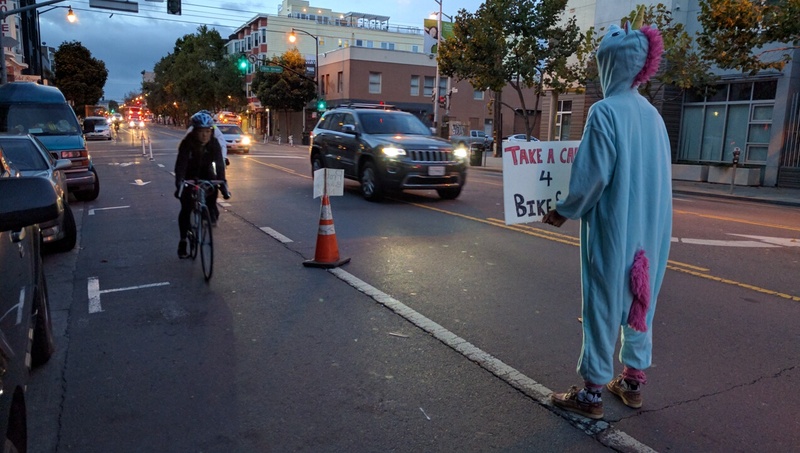 This time three members of the group, who go by the handles Copenhagen, Dragon (who came with a furry dragon suit), and Cone Guy, glued down 11 safe-hit posts on a stretch of Valencia from 17th to 14th, on the north bound side of the street. “We did a busy right-hand turn, where we felt it would do the most good,” said Cone Guy. All told, the guerrilla installation cost about $300, with the safe-hit posts running about $30 a pop, which is well within their $8,000 budget, all raised from individual donations. Meanwhile, from what Streetsblog observed, not only was the installation simple, intuitive, and easy to set up, but it seemed to be working. 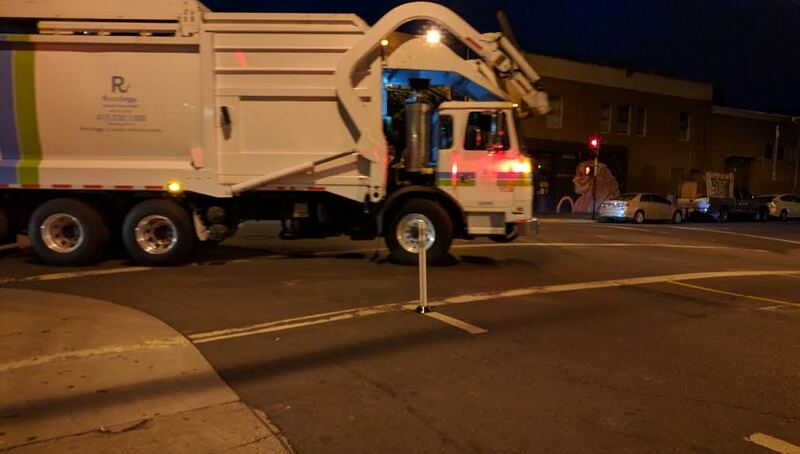 As in the photo of the garbage truck below, the posts forced cars to slow significantly when turning onto Valencia, preventing the kind of fast, sweeping, right-hook style turns that sometimes get cyclists killed or severely injured. As this truck demonstrated, there is room on Valencia for deliveries without blocking the bike lane or the car lanes. Photo: Streetsblog. And what about our notorious ride-hail services, constantly blocking the bike lanes? Streetsblog observed a few. One drove past the safe hit posts and blocked the lane towards 14th street. The solution to that is simple–add more safe hit posts. (The SFMTrA crew and Streetsblog asked the rider to give the Lyft driver a bad rating, which she agreed to do.) Another ride-hail taxi partially blocked the lane between the posts, just south of 15th, but left room for cyclists to pass, possibly because the sight of the safe hit posts reinforced the presence of the bike lane? Several other cars discharged passengers while stopped at red lights or by pulling over legally, something rarely observed the last time Streetsblog joined bicycle advocates for a survey of Valencia. Okay. So why can’t SFMTA, with their enormous resources, improve Valencia and other streets this fast and cheaply? This is a question that’s been asked repeatedly, both by advocates and elected officials. To Streetsblog’s view, it’s never been satisfactorily answered. SFMTA has also made it clear that in many cases, they will pull the un-official posts out as, indeed, they did to an SFMTrA installation on Folsom, reported Cone Guy. 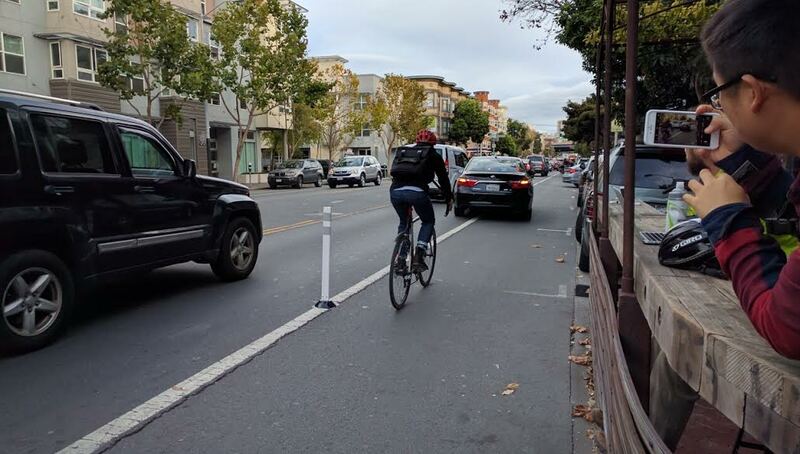 SFMTA’s policy is to pull up posts that are placed on a single line (rather than a buffered space like on JFK drive in Golden Gate Park) because they can get knocked into traffic and bike lanes. But as the guerrillas have said in past reports, they consider that a “theoretical” concern–which doesn’t amount to much, considering how many cyclists have died and been injured in San Francisco because of the failure of current, non-theoretical infrastructure. And, as Streetsblog has to add–they’re called “safe-hit posts” because they’re flexible and safe to hit. How long can this cat-and-mouse game go on, with SFMTrA flirting with the law and putting down safe-hit posts, and SFMTA selectively pulling them back up? Who knows? But the SFMTrA crew has an advantage. “80 percent of the time we don’t say where they are,” said Cone Guy. 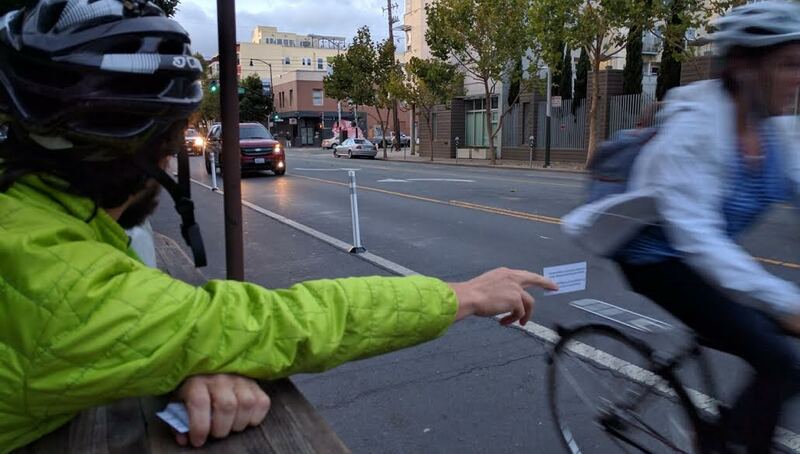 “There are 500 miles of streets in San Francisco and SFMTA doesn’t know where their own safe-hit posts are.” And while they will continue to notify the press for the occasional high-visibility installation, much of the work they do goes unnoticed–except by thankful cyclists, who send the SFMTrA money. It’s worth noting again that the SFMTrA was formed after the deaths of Kate Slattery and Heather Miller. Their hope is by showing how simple it is to install temporary, basic safety improvements, the SFMTA will be embarrassed into creating swift, ninja safety teams to take over. These guerrillas have day jobs to do and would prefer to skip the pre-dawn safety raids. Want to support SFMTrA’s work? Here’s how. I’ll stick up for the guy. He doesn’t jive with most of the opinions expressed and supported on this site but he is not a troll. Yes, he has holes in his logic big enough to drive a ’74 LeSaber through but he has a somewhat well articulated ideology supporting the continued subsidization of the private automobile and large transportation infrastructure projects seasoned with total disregard to street level issues other than the speed a private auto is able to transverse the city. Again, logic aside, he constructs an opinion, is well versed in the issues and refrains from name calling. That said, I hope he burns in eternal hell inside his car but he deserves a modicum of respect. BTW, you can mute people in Discuss. I do it off-and-on with Richy but eventually check in to see what he is up to. No, chetshome, I am equating two examples of illegal behavior – double parking and illegal installations. I equate them because they are both illegal. O see them as the same problem as a result, but you only oppose one of them – the one that personally dislike. I didn’t say that the posts would “entice” drivers to enter a bike lane. Drivers enter a bike lane either because they are entitled to by virtue of the various legal exemptions, or because they see no reasonable alternative. My point was more that if illegal posts proliferate, then drivers will start to assume that they are all illegal – even the legal ones – and so the posts will lose their deterrent value. Guy, you are correct. The term “troll” tends to get thrown around whenever there is a poster who delivers a contrary opinion and is difficult to refute. Those who disagree then throw out ad hominem terms (of which troll is just one, of course) in order to try and deflect. So I actually take it as a compliment when someone gets personal and insulting, because it means I have won the serious debate. Generally speaking, if someone could refute me, they would. When they instead go personal, we know they cannot. I also do not engage in typical troll behavior like name-calling, use of expletives, one-line throwaway comments, and so on. I try always to be civil, articulate and rational. And anyway, the moderator would remove my comments if they were considered trolling, and I’ve seen others have their posts removed, like murphstahoe and Rob. If your goal here is to help people understand the concept of hypocrisy, you’re doing a phenomenal job. After all, it’s hard to imagine a more illustrative example than watching you argue that illegally stopping your car in the bike lane on Valencia is a reasonable thing to do, then call the illegal placing of hit posts on Valencia in response to *exactly* that behavior a slippery slope to anarchy and terrorism. It’s fascinating that the moral absolutism and slippery slopes begin right after excusing the initial illegal behavior that’s convenient for you. I hear that’s the kind of argument that will lose you credibility. I’m being consistent in opposing all illegal behavior – not picking and choosing between them based on my persona biases as you are. And yes, there is a slippery slope that starts with mild forms of direct action and lead all the way to violence and terrorism. The hallmark of all them is an obsessive belief that you are right and that others are wrong, and a willingness to break the law, cause suffering for others and impose your view upon others. I never said double parking was “reasonable”. I said it was understandable given that there is inadequate parking. You said that you yourself double-park in the Valencia bike lane. Not exactly a stirring opposition. > I never said double parking was “reasonable”. “I really do not see the problem with a 60 second drop-off.” – RichLL, on double-parking in the Valencia bike lane. You’re not blocked, Drew. There are lots of posts I do not respond to – reasons vary. In fact I don’t block anyone here. Unlike njudah, Corvus, murphstahoe and chetshome, I do not fear those who speak the truth, nor am I offended just because someone holds a different opinion. I believe in diversity not censorship and suppression. Stuart, I disagree. A person can support a law while not always following it. So for instance I support the law against double parking even though, on occasions, I make the informed judgement to briefly double park. To the other, I can think something is “unreasonable” without believing that a brief transgression causes actual harm. If you recall I stated that double parking is not inherently dangerous but rather may encourage dangerous behavior in others. I said it’s more a convenience and civility issue than a safety issue. What logic? Now you’re just typing in random nonsense. I did not say illegal behaviour is the solution to anything, nor did I condone it in any way. 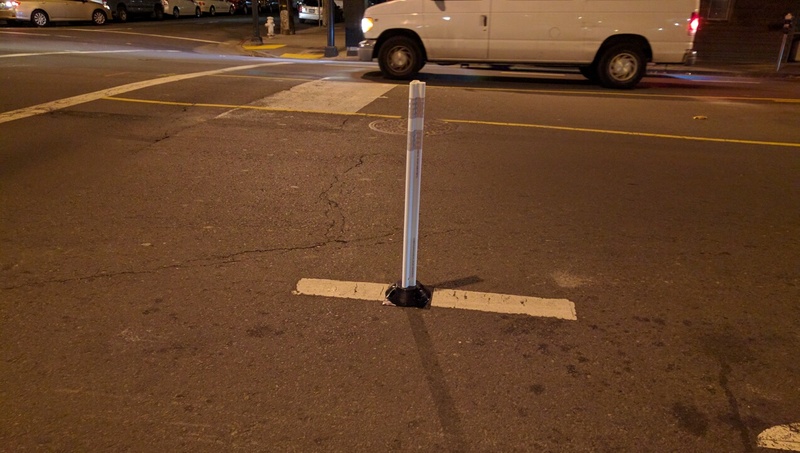 I did challenge your proposition that in this particular case, illegal act of encroaching upon an existing bike lane is somehow commutated by or spurred by the illegal act of installing soft hit posts. The former is illegal on its own and yet fairly widespread, even without the latter. If you feel compelled to read some delusional message between those lines and respond to it, go for it. farazs, if you look carefully at the pictures, you will see that the posts are OUTSIDE the bike lanes. This was presumably done so they would not obstruct bikes, only cars. So in fact a driver could drive through and over the posts without ever encroaching into the bike lane. But I’m glad you agree with me that you oppose illegal behaviors such as erecting unapproved obstacles on the roads. I have no problems with a driver driving over a post without ever encroaching in to a bike lane. In fact, even a LEO would be hard-pressed to find a statute to cite for it. FTR, not condoning is not the same as opposing. Its not something I would participate in or contribute towards or advocate, but I will defend it against baseless and biased attacks. Only one “attack” applies here. These posts are illegal. And I agree that a driver who destroys them has legal immunity. May be. Going back to where it started, “these posts” is ill-defined – we don’t know which ones are unsanctioned. A driver that destroys posts that were sanctioned by SFMTA has NO legal immunity under the excuse that SFMTA should have removed the unsanctioned ones. Thanks, I needed a good chuckle. You win the internet today. I don’t disagree. However my original comment was that the greater the percentage of posts that are illegal, then the greater the probability that a driver will assume any given post is illegal, and so the less likely he is to care about hitting it. Sure, if it turns out to be a real post AND a cop happens to see him, then he might get a ticket. But I wonder how many drivers have ever been cited for incapacitating a soft-hit post? Not many, I suspect. They are more indicative than obstructive. We’ve already established that neither you, nor I, nor the drivers care too much about drivers hitting the posts. The point of contention is crossing over the post in to the bike-lane – unless one is turning right within 200 ft, it is illegal any way. So if the existence of posts discourages some drivers from entering the bike lane illegally by reminding them, its a net positive. For those drivers that don’t care about entering the bike-lane, I don’t see how the presence or absence of posts is going to affect their decision. They are meant to be indicative rather than obstructive, which is why you are having such a hard time vilifying their installation and having to resort to BS reasoning like ‘law of unintended consequences’. No, there are other valid reasons to drive into a bike lane, including in an emergency, or if a cab setting down or picking up, or if a utility truck on business, or when entering or exiting a driveway.. There are of course other “illegal” reasons as well, like compelling convenience or a lack of alternatives, which is probably much the same reason as cyclists rationalize breaking various traffic laws. I stand by my original point – introducing a large number of illegal posts will cause drivers to believe that they can be ignored. Name calling isn’t the only thing that can make someone a troll. The question is whether he’s actually arguing in good faith. If he’s genuinely an educated and articulate person who really is capable of the extreme cognitive dissonance required for some of his incredibly illogical arguments to be genuine (e.g., saying that breaking a law while claiming to support that same law is not hypocrisy when he does it, while simultaneously chastising other people for the supposed hypocrisy of supporting one law while breaking a *different* law), then he’s not a troll. If, on the other hand, he knows that many of his arguments are nonsense and is deliberately flooding the site with them as a game for his amusement, then he’s a troll, no matter how politely worded his posts are. Only he knows for sure which, of course. In fact, that refers to an observation that you were cherry-picking which laws are worth following. If you really want to know why I comment here (your last sentence), why don’t you just ask and I’ll tell you. But it would be better if we discussed the topics here rather than attacked each other, don’t you think? Now you’re trying to muddy the waters because you’ve run out of arguments. If there is an emergency, any driver can easily go over the soft-hit posts – as you said yourself, they’re an indication, not an obstruction. Likewise for utility trucks – hopefully with appropriate signs indicating that the lane is closed. AFAIK, there are no soft-hit posts blocking drive-ways anywhere – if there are, they should be removed ASAP. As for cabs, this has been discussed to death already – just because the MTA makes an allowance for cabs to pick-up and drop off in bike lanes in some places, does not mean it is a right that must be extended to every bike lane. You can stand by whatever you want to, you’d still be standing on nothing. farasz, you continue to be confused here. I’m just not sure whether you cannot understand my argument or are being obtuse. I’ll give you the benefit of the doubt, for now, and explain further. If you really want to know why drivers enter bike lanes even though they know it’s illegal, the simplest way to understand that is to ask cyclists why they fail to stop at stop signs. In both cases the act is illegal. In both cases the driver/cyclist knows that. And in both cases they make a judgement that it still makes sense to take the risk and do it. The difference between us is that I believe one can support a law in general even while sometimes making exceptions to it personally. You appear to lack that cognitive range and breadth. So to be clear, do you support the illegal activities by SFMTrA? I’ve already replied to that, so you tell me who is being obtuse? You don’t really have an argument beyond slippery slope. I am not saying that is not a good enough or not sufficient – just that it’s all you’ve got. You can call me what you want, it won’t change that. Since you have failed to answer to several of my questions, and failed to refute several of my points, I’m afraid the ball is still in your court. And by instead making only personal remarks, you effectively are admitting your defeat. That’s really a rookie error. RichLL — did you change your handle from RoyTT? Sorry, I don’t have a response to your delusions. You can continue to think that the entire argument up there did not happen or that you somehow won. 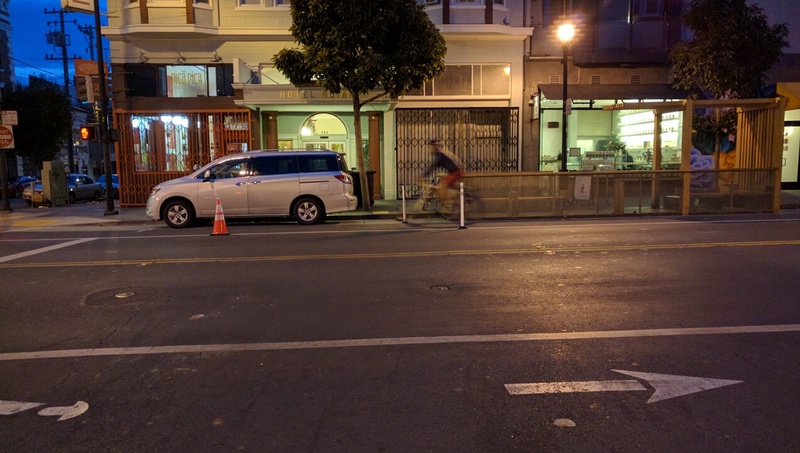 If the SFMTA allows the unauthorized posts to stay they prospectively would subject themselves to legal liability if a cyclist and/or pedestrian is injured as a result of an unauthorized dislodged post. As you noted, by all indications SFMTA is trying to protect itself, not cyclists. 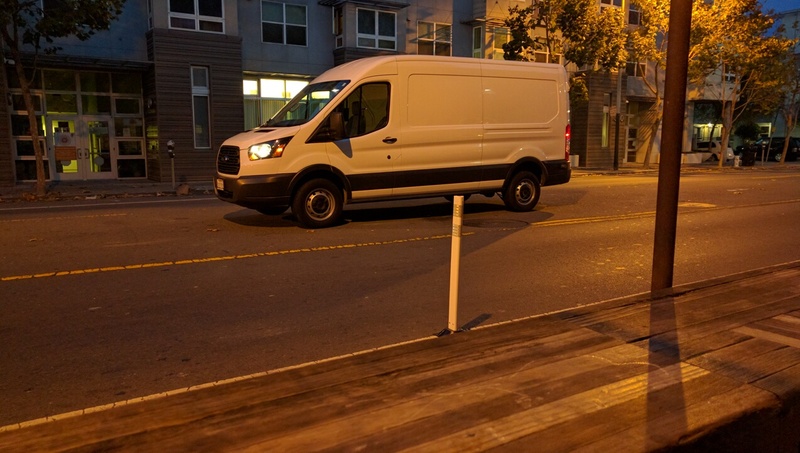 As for actual causality – if a cyclist falls due to a dislodged post, that will immediately be noticed, but the instances where a cyclist or pedestrian is made safer (or made to feel safer) will never be accounted or acknowledged by SFMTA. So if we go by what one party (SFMTA) dictates, there is absolutely no upside to these activities to counter the potential danger they create – but that is only a part of the picture. You can keep beating your head against a wall or block the user and move on with your life. I am tired of seeing 82 comment threads with 41 “This user is blocked” but it beats actually seeing those comments. I did not know that you could block individual users. You’ve just solved my Streetsblog problem! do you have a source of documentation of those complaints? Evidence that they were dangerous?